This looks so good, going to make it. 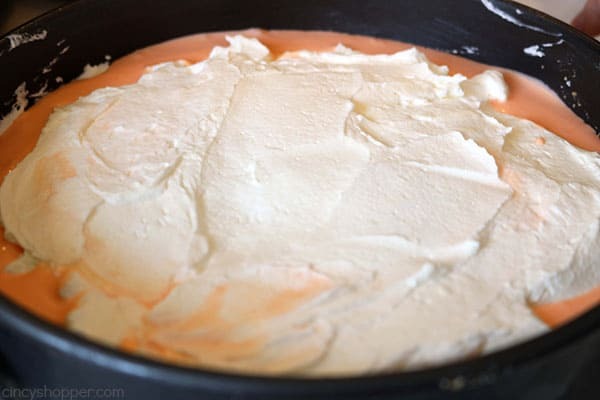 Am I not seeing this?, I don’t see the step where you mix the gelatin mixture with the cream cheese mixture. Will this work with other gelatin flavors? Can u use cool whip instead of heavy crepe? 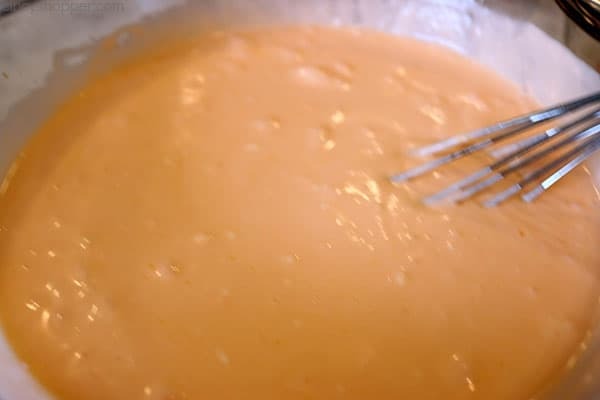 You add gelatin @step 11., to half of the cream mixture! This sounds so yummy! I love cheesecake and my kids love creamsicles so we’ll have to try this over the summer. My favorite no bake cheesecake tends to be chocolate. I made a really delicious double chocolate no bake cheesecake a few weeks ago and it was pretty yummy. Thanks for sharing; Pinned! In your steps, you say orange cream cheese mixture, but you never tells us to mix the cream cheese with the orange; just the whipped cream. Did you miss a step where we combine some of the cream cheese mixture with the orange, or did you mean to say the orange cream mixture? Just asking as I’m uncertain of what I should do. 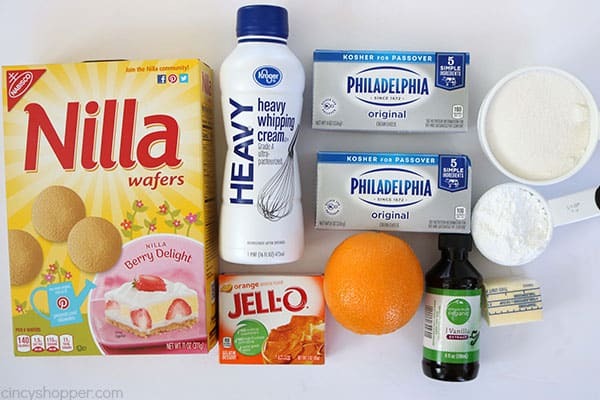 Where is the recipe fixed from the step of adding the cream cheese mix to the orange mix? Please help! I really want to try and make this recipe for my family. Thank you! I see why this is a winner at your house! It looks amazing and I hope my family likes it also. 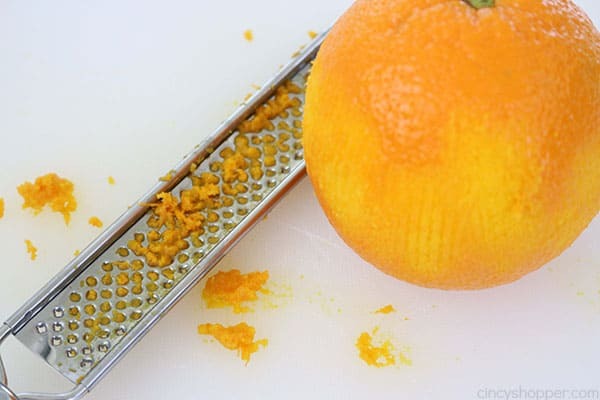 Could I replace the orange zest with a little orange extract? Just made this and it’s in the frig. The flavors are delicious but there is no way the second cream layer will spread on the orange layer so I jus plopper it on lol. Can’t wait to try it! I let my orange layer sit for a few minutes before I put the cream cheese mixture on in dollops and spread with a spoon. Worked out great. Now we’ll see how it looks in a couple more hours when I cut it!! 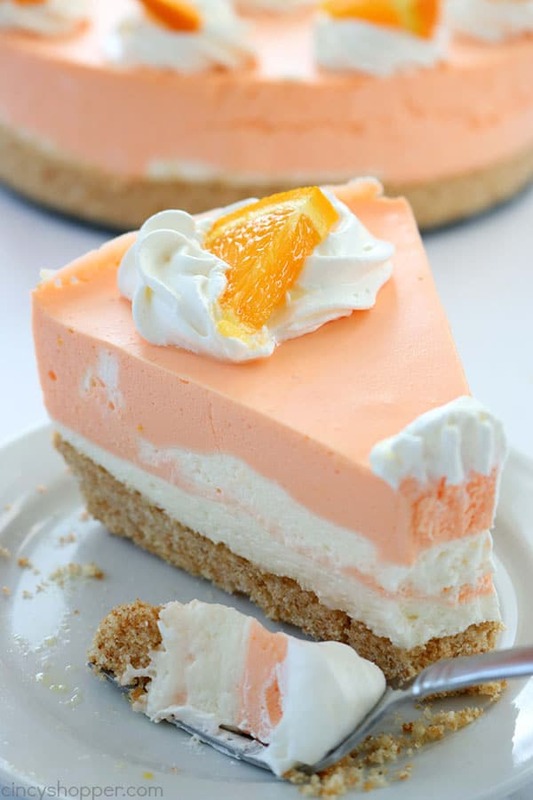 This looks absolutely delicious….and the color is perfect for summer. thank you so much. I want to make this now.! It says 13.3 oz orange jello, is that right. I used 2 6 oz, hops it turns out ok.
Hi, Is it correct that you use only HOT water for the jello ? 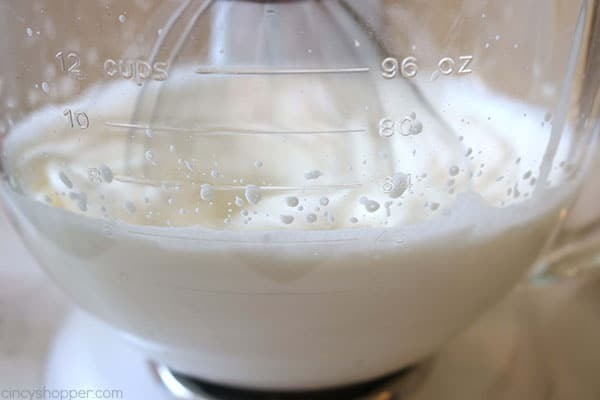 Hi, in the picture I see heavy whipping cream, but the recipe says heavy cream? Which one do I use? Thanks!! Could this be made as bars? It would be easier to serve at a potluck. 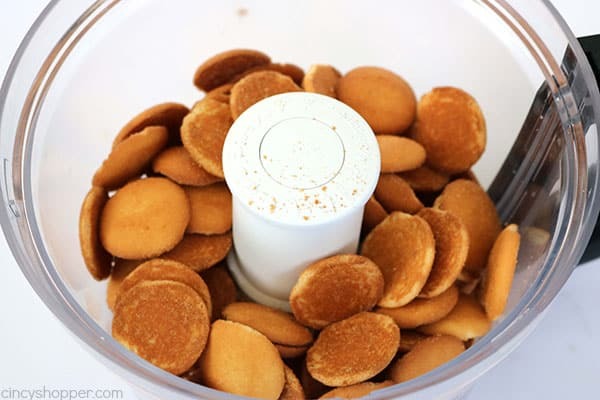 Hi, your separate Nilla Wafer pie crust is different than this recipe. It calls for 1/2 cup sugar and 8 oz of wafers. Which works the best? Thank you. I also could not get the second cream layer to spread on the orange layer, but I’m sure it will still be delicious!! How long will this desert survive outside in the summer?? in other words, could it be used at a potluck barbecue?? The filling is wonderful but the crust needs more butter, perhaps 1/2 cup if you are using all the crumbs of an 11-oz. box of vanilla wafers. My crust just crumbled off so next time I will use more butter in the crust. This looks amazing! I’m not much of a baker because when I cook I don’t measure. I will with this recipe. I don’t have a spring foam pan is it necessary? And what would be an option? Thanks. Delicious! My humble hint: Replace the water with the juice from the zested orange (I have frozen fresh orange juice and use that to make up the entire 1 cup water). 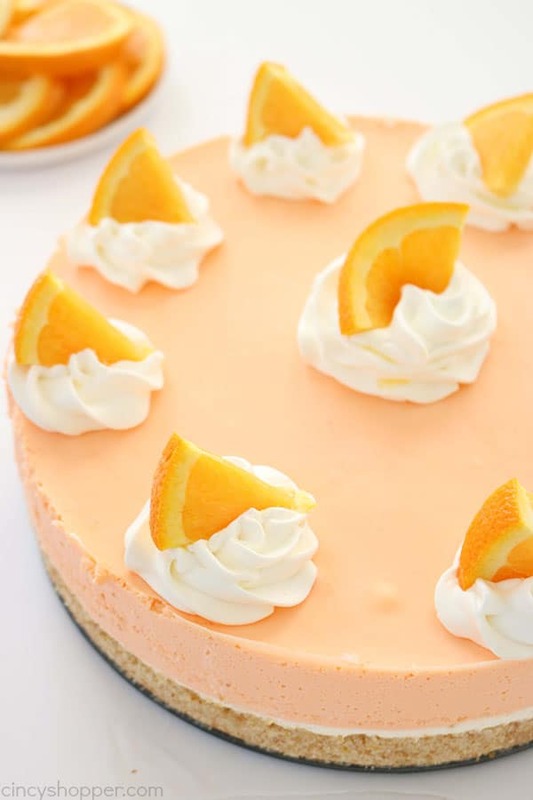 Does the Orange part of the cheesecake get kind of “gelled”. I am not sure I would like that texture. The cheesecake part tasted very very good! The crust was too thick, but also tasted awesome! 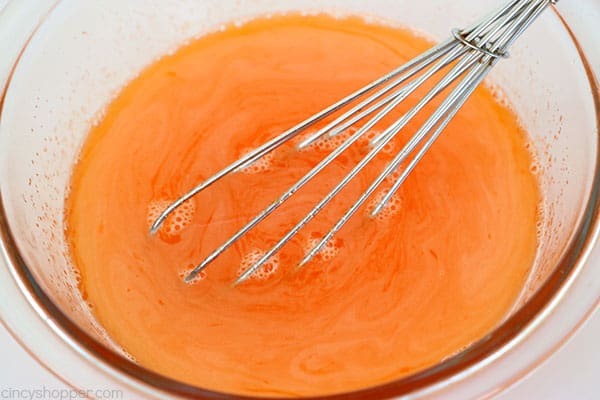 I found that the orange whip mix portion was a bit too soft and had the tendency to slide off and fall over. which didn’t matter for us, but if you were trying to serve this at a party it would get ugly and messy fast. 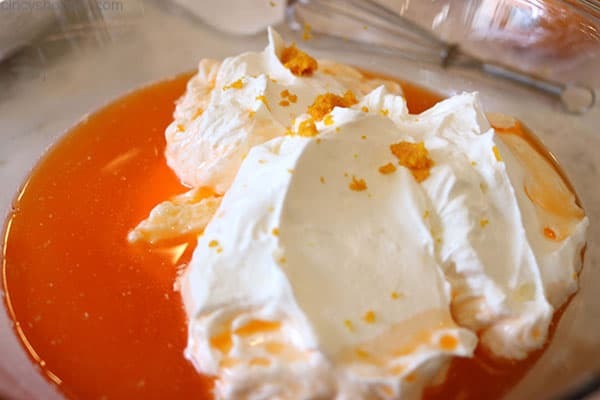 I think if I try it again I will use only 1/2 cup of water for the jello pack and add the juice of the orange I zested as an alternative liquid for an bit stronger orange flavor and a bit less liquid overall. Can you use store bought cool whip??? Hi Tina! 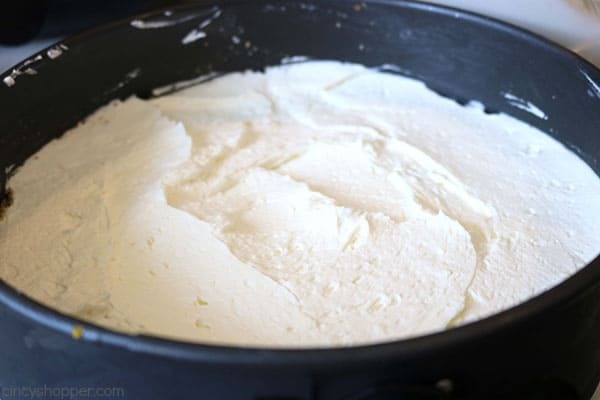 I have not tried the store bought Cool-Whip with this recipe. I am thinking it would not get the same consistency. Be sure to let me know if you try it. Jello only comes in 3 oz or 6 oz. The recipe calls for 13.3 oz. I’m confused. Made this over the weekend and the flavors were fantastic. It was a huge hit at our family potluck. But when I make it again I will just have the 2 layers. 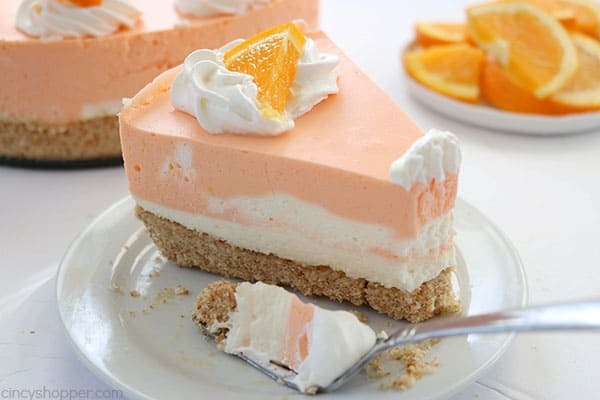 The cream cheese on the bottom and then the orange layer on top. 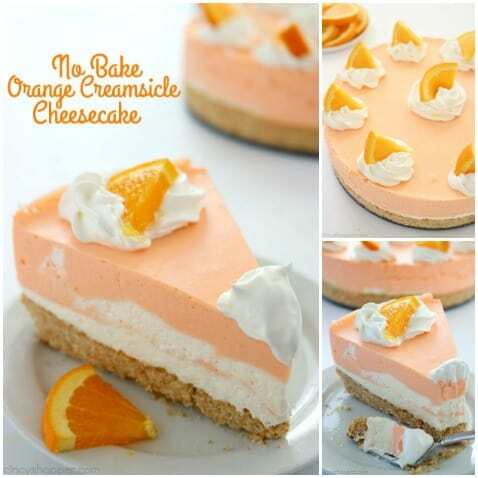 The cream cheese is too heavy and the orange layer is too liquid to try and layer twice over. I am just wondering how long this will keep in the fridge since there is jello in it? i know sometimes those lose their structure and give off some liquid. Hi Christine! I have never tried it with the Trivia! I am sure you could give it a try though. Do you have to layer it?? Hi Karin! Sorry for the delay. We were on a family vacation. You can most definitely freeze this one. I hope you enjoy! Can this be made in just a regular pie pan or does it have to be spring form pan? 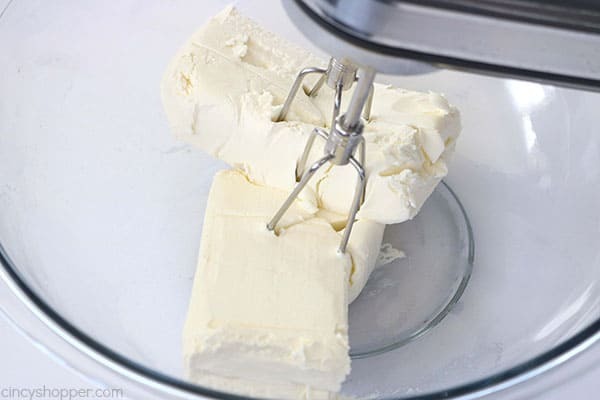 Can this be made in a 9×13 pan? Just made it. Too many layers . does not spread well. I just made the recipe for a special gathering tomorrow. I wanted to use a 9×13 pan to encourage smaller pieces at the buffet table. Since it was going to be a bit shallower, I put most of the cream cheese mixture on the bottom, followed by all of the gelatin mixture, and finally added dollops of the cream cheese mixture on top. I tried to marble it a bit. It will be served 26 hours from now so I hope it holds up well. I saw this for the first time last night And immediately knew I wanted to make it. And I have the perfect occasion for it. June 23, 2018 For our senior high school brunch. We are having a Hawaiian themed brunch. It looks amazing and it has always been a favorite order from the ice cream truck on a hot sunny summer treat and it still is my favorite. I will let you know how students comments. I made this twice in a matter of days for two different occasions. It is easy to make, beautiful and delicious! Received lots of compliments! I made it a day ahead both times. I made this today, cant wait to cut in to it. I put it in the freezer for 20 minutes to stiffen orange layer defore adding next layers, worked out great!! Can this be made ahead and then frozen until ready to use? Hi Petie! Sorry for the delay. We had a family vacation so I was out of town. You can most definitly make it ahead and freeze. Curious thing happened when I made this. The crust never set up; it was dust in the bottom of the pan. It doesn’t say to cook the crust but I wonder if that would have helped. 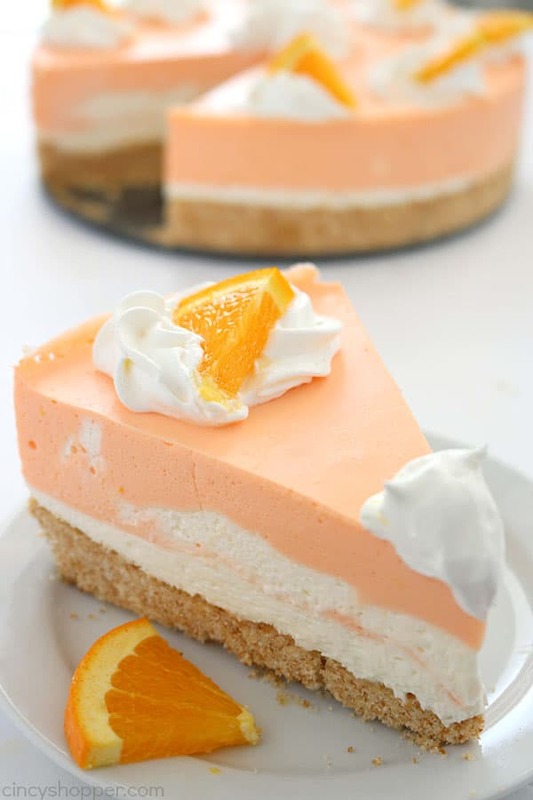 As a lover of oranges, this is the best orange creamsicle recipe I have made and I’ve made a lot! My suggestion to amp up the orange flavor is to substitiute the juice from the orange(s) for the water. Yummmmmm! Just curious – how many cups is 11 oz of the vanilla crackers? I don’t usually measure dry ingredients in oz. Thank you! Yum, was so so good, only thing I would change is more butter is needed for the crust as it was too crumbly. Other than that it tasted exactly like a creamsicle. Made it for our Canada Day celebrations will make it again. I grew up on creamsicles! Going to make this very soon. I also love Kroger’s–they are the best! Very Yummy, however I would not have the crust be so thick. also, I froze each layer as I did it and came out perfect. If using graham crackers for crust do you still use the 3/4 cup of sugar in crust? Hi Lucille! Sorry for the delay. Summer has kept us very busy. I would use the same amount of sugar if you are using graham crackers. I know this is repetitive but the crust was a let down. I didn’t use all that it made cause it was too much. ‘Sandy’ is the word. Otherwise it was great ..just what we needed on a hot day! My family loved this cake. I can see all sorts of options available – lemon/coconut; lime/coconut…mmmm! Delicious! Thanks for sharing. I was distracted and put 2cups of the orange mixture on top of the crust. Then I did the cc mixture, a little bit of orange, then rest of the cc then rest of orange on top. In the fridge now. Do you think it will still be ok? I made this for a BBQ and it was a total hit! Everyone had to have a piece, and everyone loved it. It was delicious and so refreshing. Will definitely make it again! I made this yesterday and. I thought that it was very sweet,I think the next time I would use unsalted butter for the crust& no sugar,the vanilla wafer are sweet enough. I recently made this for a family celebration. Overall it was a big hit. It definitely tasted like a creamsicle which we all love. For us the crust was a bit too thick and also pretty dry and crumbly and overly sweet. Were I to make it again (and I will) I think, for the crust, I would switch to brown sugar but use maybe half the amount, use fewer cookies and possibly still use a bit more butter, depending on how the texture came out. But, I would absolutely use the Nilla wafers again, the flavor was spot on. In my area Jello comes in a 3oz box, not 3.3oz, so I reduced the water by ~10% as well, and it set up very well. As someone else suggested, I would also recommend a few minutes in the freezer between the last couple layers to aid in spreading the mixture. I did this and it worked like a charm. Thanks for posting the recipe, it was lovely! I made this for a church fellowship about six weeks ago and the compliments are still coming in. It really was good. As another person noted, the crust didn’t set up well, but it was still devoured. Next time (and there will definitely be another time!) I’ll try baking the crust and use a little more butter in it. Great recipe. Thank you. This was a huge hit when I made it. 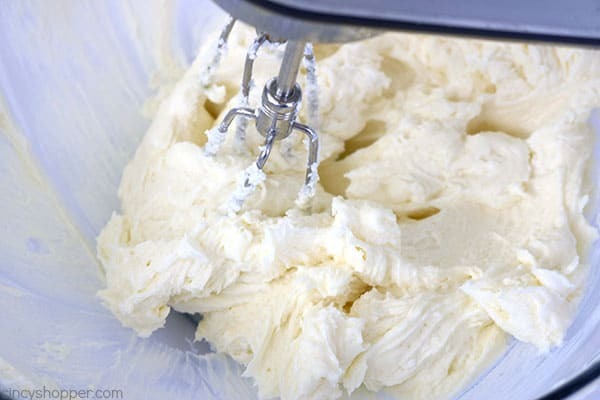 I did have to add 2tbs of butter more than the recipe called for the second time I made it. The first time it just fell apart in some spots. I’m going to try it with raspberry jello next time. I’ve made your recipe several times, now, once for a funeral and for our Bible study group. Many compliments and requests for the recipe. After the first time, I baked the crust a bit, like a graham cracker crust, and it held up very well and still tasted great. I’ve layered it and I’ve swirled it – prefer the swirled. Also tried it with Cool Whip, and that worked very well, too. Everyone seemed to prefer that. I’m not a Cool Whip fan, doesn’t sit well on my stomach, so my go-to is the cream, but for others, I make it that way now. Thank you so much for sharing this great recipe. I made this, It’s great. I recommend it as posted, but…. 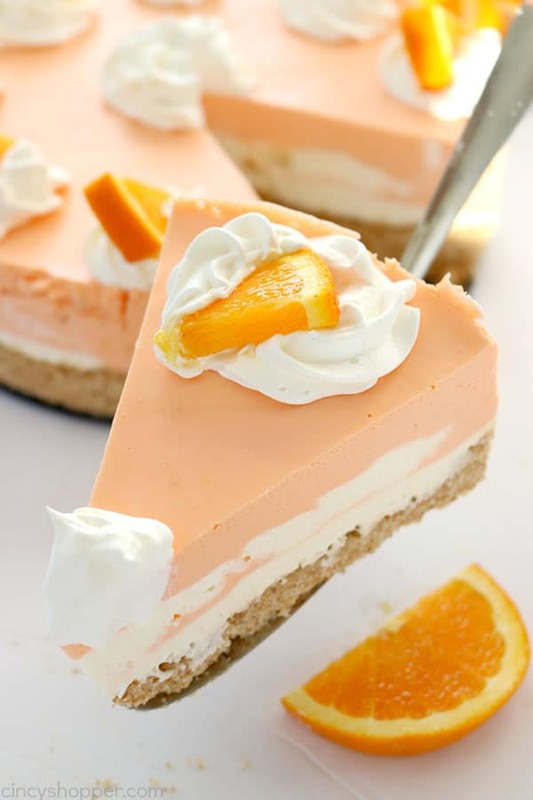 I have a package of frozen peaches (in the freezer and I want to use them) thinking of using this recipe to make a peaches and cream cheesecake. I was wondering if you had any suggestions. I’m thinking swap peach gelatin and frozen peaches for the orange and use the recipe as posted. That sounds AMAZING! I think I may need to make a version you are mentioning. It should work perfectly. I shared a raspberry one here on the blog too. Peaches so like such a great version. Let us know how it goes for you. Although more of a summertime dessert, I just made this for Super Bowl Sunday. Licking the bowls was delicious! 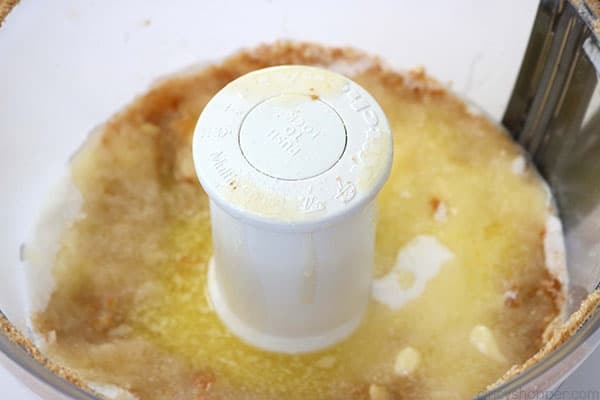 For those of you who complained about the crust being too thick or crumbly, I recommend using a one-cup measuring cup to press the crumb mixture into the springform pan. 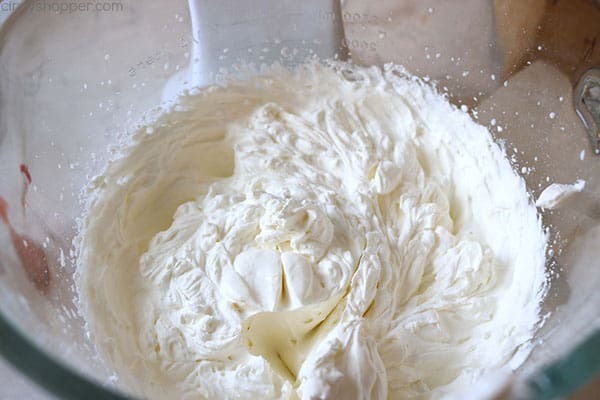 Also, when adding your second layer of the cream cheese/whipped cream mixture, add it evenly in small dollups as it is difficult to spread. Go Patriots! Creamsicle pops were one of my favorite things to eat growing up. 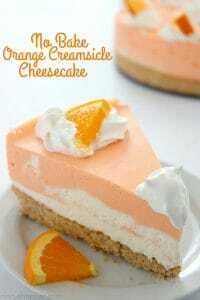 So excited that I can make a giant orange creamsicle cheesecake now. Pinning. Just dropping in from Funtastic Friday to get the recipe for the cheesecake. Your pictures, even the instruction pictures, look great! Thanks much for dropping by Kristie!